Today, Games Workshop made the full announcement about the upcoming release of their new Finecast line of miniatures. For those who are yet unaware, Finecast is their new branding for their miniature casting process which replaces their metal line of miniatures with a resin line of miniatures. Despite all the negativity GW has received in the last week about price increases and and the trade embargo, and their ludicrous canned response, this addition of the Finecast branded line is actually very exciting, and, in my eyes, a very good thing for the hobby - and a long time coming. The reasons for the switch to a resin casting process and a metal casting process is many fold. But the primary reasons as I understand it, and GW has indicated, are that the raw material is cheaper and has a steady price over the long run, not fluctuating as wildly as the commodity prices of metal; and the inherent quality of resin versus metal casting, when looking at mouldability and detail, is significantly higher. There are other benefits to the switch to resin, such as being easier to model with, being easier to cut, convert, pin, etc. And easier to play with, move, and travel with, as they are significantly lighter. So, for those of us who are among the jet setting gamers, who bring our armies with us when we travel, it will make your carryon baggage much lighter, as you will no longer need to have any miniatures in metal - except of course your legacy models. In their press release, Games Workshop announced the miniatures will be available in stores starting on Saturday May 28, and in mass quantity, where you will find over 100 new clam packs and boxed sets on display. The stores will also have a new look, to showcase the new branding of the Finecast range, and you will likely see a Finecast Point of Sale spot in the stores, with all the trappings of the new Finecast logos, and backgrounds, and such. They also mention new packaging, called clam packs, which will be replacing the blister pack as we know it. 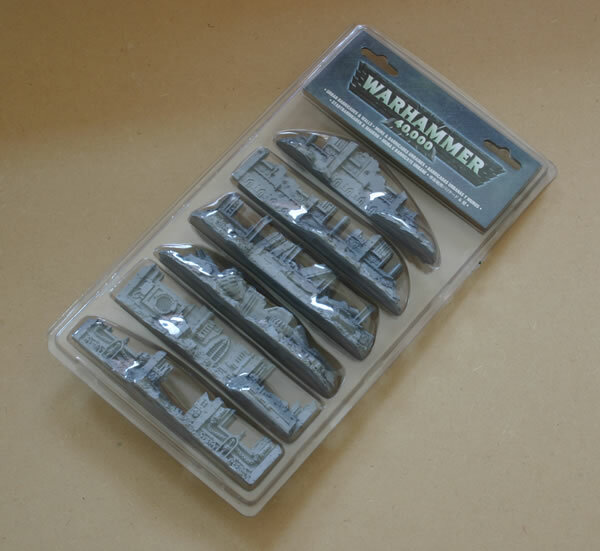 And you will have already seen clam packs in use by Games Workshop previously. A good example of that is the Urban Barricades and Walls. This appears to be another cost saving measure in terms of their production process, since a clam pack is a single piece, and requires almost no post processing to seal to a card shell, yet a card insert can still be placed inside for branding purposes. And after the staple has been removed, it can easily be opened and closed numerous times, for storage of your model after purchase, if you are a hoarder (like me). Here is an example of what the new Finecast clam pack might look like. So, what about the detail of the models? Will it really improve? Of course I am reserving judgement until I can actually see and hold a Finecast model and hold it up side by side with a metal version of the same model, but from all the pictures GW has posted so far, the detail is definitely sharp and crisp, and there is no loss of detail, and at least one staffer I know has suggested they will be buying Finecast versions of models they already own, as they are that much better. I expect it will be better too, simply due to the nature of the materials, and likely having all new moulds. Not to mention, Games Workshop has already got a lot of experience with resin casting, not only from their Forgeworld line, but from their preproduction casting of model masters (as seen at Games Days over the last few years) and 3 Ups, in their past. This vast well of experience will undoubtedly stand them in good stead. Some of you have inquired about the safety of resin, especially since resin dust is known to be carcinogenic, and Games Workshop made a concerted effort to switch from lead to tin pewter in the 90s due to the toxicity of lead. Well, from what I am told, and what GW is indicating is that this is a special resin blend with non-toxic materials. Again, judgement will be reserved on this one, but I suggest always handling with care, and using a dust mask when working with the material, even for minor flash cleaning. Overall though, my impression on the upcoming Finecast is a positive one. It's just a shame that it is being tainted with all of the negative news about price increases and regional trade embargoes.